Dine 909 favorite (before Dine 909 even existed…yes, their number is programmed into my cell phone) Alfredo’s Pizza and Pasta is offering a very generous bargain to frugal diners. Sunday through Thursday, buy a meal and an appetizer at regular price and get another meal of equal or lesser value for free! Yep…buy a lunch and an appetizer and get a free lunch of equal or lesser value. Ditto for dinner. Alfredo’s has always been generous with their deals (I don’t think I’ve ever paid full price for a pizza there), but this is the first time I’ve ever seen them offer any kind of bargains during their lunch hours, so you’d be wise to take advantage. three decades), where have you been? According to this blurb in today’s Redlands Daily Facts, the Gourmet Pizza Shoppe (a Dine 909 Favorite) in Redlands and Yucaipa is paying your taxes in honor of the tax month of April. Your sales taxes, that is. For the month of April, the “shoppe” is helping out diners by taking care of the sales tax. With California sales tax at an all-time high, that certainly helps. In addition to not having to pay sales tax, after 3 p.m. on Tuesdays, pints of Hangar 24 beer will only be $3 and you can get $5 off a 16″ pizza. Wait a minute…today is Tuesday! I guess that answers my question about what’s for dinner tonight. Now comes the tough part…deciding which of their unique pizzas to order! The Old Spaghetti Factory, which is celebrating its 40th anniversary this year, is still celebrating. And why shouldn’t they? Their 40th anniversary lasts all year! Beginning Tuesday, March 31, they are repeating the deal they had earlier this year…40% off their Pasta Classics. This deal will be offered for lunch and dinner every Tuesday from then until May 26. Considering that their dinners include soup or salad; hot tea, iced tea, coffee or milk; and a scoop of spumoni or vanilla ice cream, it’s a terrific bargain and a great way to help beat the recession. Click here to see all the outrageous specials. If there’s one thing Dine 909 enjoys, it’s a great bargain. Thankfully, Mike & Judie’s Grocery Warehouse, at 580 Inland Center Drive in San Bernardino, is full of them. I returned to shopping there late last year after stopping at the Harbor Freight Tools store next door to buy an electronic bug swatter. Yep, you read that correctly. And it works great. After a nice Sunday afternoon late lunch at P.F. Chang’s in Victoria Gardens and driving down to Ontario Mills to see if Virgin Megastore was still in business (they were, but only selling store fixtures and such), we decided to go to Handel’s Ice Cream in Upland. For the uninitiated, Handel’s Ice Cream is an Ohio-based chain with other locations in Pennsylvania, Indiana, Virginia and…Upland. The Upland store(373 S. Mountain Ave., at Seventh Street)was opened under a franchise agreement by an Ohio native who grew up enjoying Handel’s ice cream and wanted to own his own Handel’s. He ended up in Southern California and made his dream come true. Thank you! Accolades: The National Geographic publication “The 10 Best of Everything: The Ultimate Guide for Travelers,” named Handel’s one of the 10 best ice creams in the world.Ben Cohen, co-founder of Ben & Jerry’s ice cream, has included Handel’s in his list of top 10 U.S. ice cream stores. Happy 11th anniversary, Gourmet Pizza Shoppe! 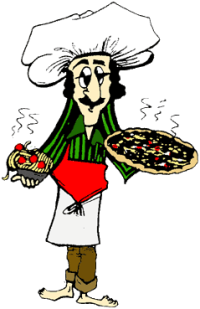 According the Redlands Daily Facts, the Gourmet Pizza Shoppe is having an anniversary special this Saturday, January 10. From 11 a.m. to 9 p.m., all 7-inch pizzas are $5 each. Wow! Also, this month, any two 12-inch pizzas are $20.09. Double wow! The specials are available at both their Redlands restaurant at 120 E. State St. and their Yucaipa restaurant at 13661 Calimesa Blvd. Read the original blurb here. If you’ve never been to the Gourmet Pizza Shoppe, you are truly missing out. Their unique (and I do mean unique…check out their menu on their Web site) pizzas are delicious and the folks that run it are very friendly. It’s definitely a Dine 909 favorite, and probably the best pizza I’ve had in the Inland Empire. Really, where else are you gonna find mashed potatoes and gravy and fried chicken on a pizza? The Old Spaghetti Factory is rolling back prices on classic pasta dishes to celebrate its 40th anniversary nationwide. Manager’s Favorite, all for about $2.35 to $3.45 per person. From the OSF Web site comes more bargains throughout the month: 40% off select dinners on Mondays and Tuesdays January 12th to the 27th. Spaghetti with browned butter and Mizithra cheese for only $5.99? You’ll see me there! Only one question remains…which IE location will be less mobbed? Riverside or Rancho Cucamonga? Sometimes the Inland Empire is lucky enough to get something that nobody else has…a giant arrowhead on the side of a hill, for instance. Sometimes it’s a dining experience. Jason’s Deli is a Texas-centric chain with locations in 23 other states, including California. Lucky for us, Jason’s sole California restaurant is in the Inland Empire, at 2555 Canyon Springs Parkway, in Riverside.